How do you get three months of gear onto two Mt. Bikes. Well you start with a trailer, then you add saddle bags, seat bags, top tube bags, top rack bag, and a bag of tricks. Hoping as we ride some things will just bounce their way off! Well if you tell enough people you are going to do something, then eventually you begin to believe you can pull it off. I have had my doubts since we first started thinking about doing this over a year ago. Not from the physical aspect per say, as most might think, but more from the, do I really want to put my 60 year old body through a possible 90 day camping trip?!?! Sure there will be some hotel days but this is basically a long nomadic camping trip on bikes. Yikes! I admit it, I love a nice bed, 2.5 nice meals a day (not prepared by me), an occasional trip to a luxurious pool, and certainly a warm water surf session as often as possible. I am spoiled! There I said it. But, having taken on two Ironman’s I have learned you CAN DO ANYTHING you really set your mind to. I just needed to get on board with camping for 2700 miles with only what you can carry on two Mt. Bikes. Then I watched the move, Ride the Divide. If you haven’t watched it, and you are on this blog site, then you should. Netflix has it. It is all the movie’s fault. I love adventure, and this is pure adventure. In the movie they are racing 2700 miles which to me is crazy. Without really thinking, I thought wow, this would be a lot of fun to do, not as a race but as a really long ride. I love long bike rides and have always thought riding a bike a across America would be the perfect way to really get to see our beautiful country. I told Denise about it thinking there is no way she would be up for something as crazy as this. To my surprise, she came back with, yea thats the one I told you about, “I think it would be fun”. I forgot how much she loves camping, so I walked right into my own trap. Hans introduced me to long bike rides. 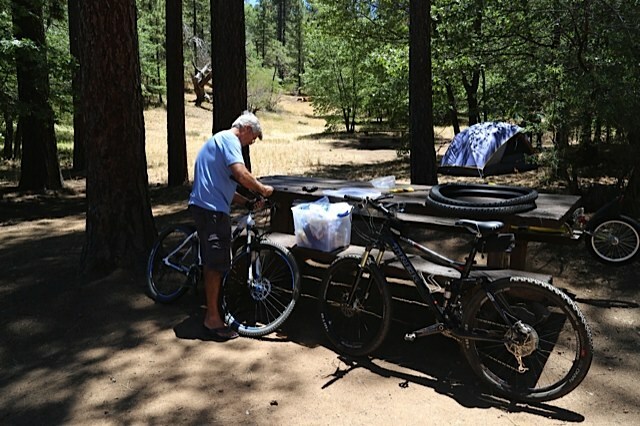 I’ve always loved a good day on my mountain bike but he had me out on the road racking up miles in preparation for various triathlons, my one and only Half Ironman, and my longest ride to date which was 72 beautiful miles around Lake Tahoe. He would often talk about wanting to ride across America but he was talking road bike. Road bike, paved roads, cars-lots of cars- their exhaust, and a ridiculous amount of miles. I knew that was a trip I would never make. In summary, she says it was her idea and I agree when I am not wanting to do it. I say it was my idea when I think it was a good idea. If we make it, IT WAS MY IDEA! if we don’t, I CANT BELIEVE I LET HER TALK ME INTO IT!